Smith & Wollensky is located in a spectacular setting, where outstanding steakhouse fare is served, featuring USDA Prime steaks, dry aged and butchered on premise. 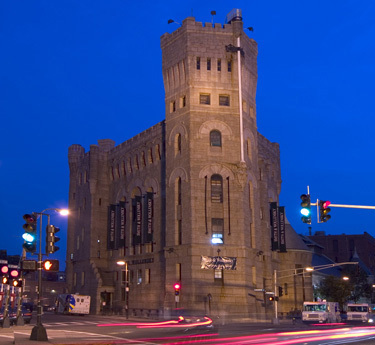 Built in 1891 as the Armory of the First Corps of Cadets, this treasured landmark is known to most Bostonians as simply "the Castle." The space has been restored meticulously to recapture the integrity and great beauty of the original millwork, masonry and wrought iron ornamental work. Accented by seven working fireplaces, the dining rooms span four floors that blend fun and formality, featuring a folk art collection and vintage American flags. Although Smith & Wollensky earned its reputation as the quintessential American steakhouse, the menu is varied and offers many options beyond the exemplary steaks. Guests can also select from a variety of market-fresh seafood, poultry and lamb. Delicious side dishes complete the Smith & Wollensky meal, such as creamed spinach, hashed browns and seasonal vegetables. The irresistible dessert selection delights with a variety of decadent, housemade cakes, sorbets and ice creams. The award-winning Wine List offers over 550 selections from the USA, France, Italy and Spain with a section devoted to Undiscovered Gems, which are lesser-known wines of outstanding quality. Boston media have responded with extremely favorable assessments of the restaurant's cuisine, decor and service. The Boston Globe said, "Great setting, service, and steaks add to Smith & Wollensky's sizzle." The Improper Bostonian declared, "Smith & Wollensky serves a royal feast in the Castle."